MEXICO CITY, Apr 2 2012 (IPS) - Despite the key role they play in caring for natural resources in the face of climate change, rural women in Mexico do not benefit from payments for environmental services, say activists and experts. “Women help in the tasks of reforestation and taking care of water resources, but there is no gender focus in the management of natural resources,” Victoria Santos, who lives in the town of Felipe Carrillo Puerto in the southeastern state of Quintana Roo, 1,600 km from Mexico City, told IPS. Santos is the technical secretary of the non-governmental Organización de Ejidos Productores Forestales de la Zona Maya (OEPFZM – Organisation of Forest Producing Ejidos of the Mayan Zone), which groups 3,000 families who manage 287,000 hectares of tropical forest, belonging to 19 ejidos. Mexico’s ejidos consist of rural property held communally under a system of land tenure that combines communal ownership with individual use. Most of the ejidos are owned by municipal governments or the central government. The system was ushered in by the land reform carried out in the 1930s. Ejidos play an important but declining role in agricultural production, conservation of the rural environment, and the traditional way of life of campesino or peasant communities. But the ejidos have suffered the growing impacts of climate change, including increasingly frequent and intense tropical storms and hurricanes. One illustration of this was seen in August 2007, when Hurricane Dean brought the forestry activities of 10 of the communities belonging to the OEPFZM to a halt. “Some of them have had to get involved in other activities, like farming or handicrafts, while they renew their permits,” said Santos. The OEPFZM communities, which are dedicated to sustainable forestry management and other economic activities in Protected Natural Areas, are exposed to the effects of climate change, such as drought, torrential rains, flooding, landslides and temperature increases, which affect plant and animal species as well as water sources. Women tend to do most of the work in the collection of forest products, such as firewood, forage or wild mushrooms. They are also exclusively responsible for the family garden, fruit trees, medicinal plants and barnyard fowl and pigs. In addition, women in the ejidos make handicrafts and grow corn, beans, squash and cassava for family consumption. “They store and handle the seeds, and they store water for times of scarcity,” said Vázquez, who wrote the 2002 book “¿Quién cosecha lo sembrado? Relaciones de género en un área natural protegida” (Who Harvests What Was Planted? Gender Relations in a Natural Protected Area) with her colleague Aurelia Flores. The book analyses gender relations in the Sierra de Santa Marta mountains in the Los Tuxtlas Biosphere Reserve in the southeastern state of Veracruz. Mexico’s 174 Natural Protected Areas (ANPs) cover a total of 25 million hectares. People living in these areas who are active in more than 1,000 projects involving a total combined investment of over 60 million dollars have been receiving payments for environmental services since 2003, according to the National Commission of Natural Protected Areas (CONANP). The areas under sustainable environmental management capture carbon dioxide, serve as habitat for thousands of animal and plant species, and supply water to entire regions. But they are not safe from climate change. CONANP estimates that 35 percent of the ANPs are threatened by the phenomenon. In response, a Climate Change Strategy for Protected Areas began to be designed in 2011. Castañeda said it has been demonstrated that climate change accentuates discrimination against women. Sixty percent of the land covered by the ANPs is located in ejidos, 20 percent is on public land, and the rest is on privately-owned land. The roughly 27,000 ejidos in this Latin American country of 112 million people are home to 3.5 million families, according to the U.N. Food and Agriculture Organisation (FAO). 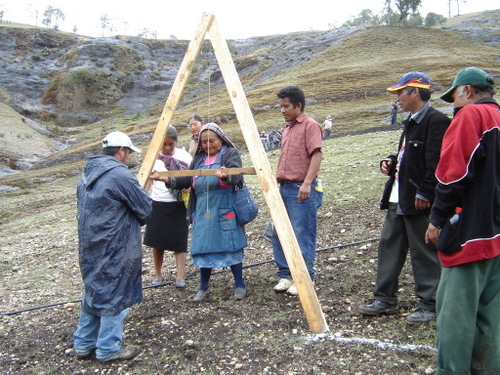 But only 20 percent of ejidatarios – members of ejidos with full land rights – are women. “The programmes do not recognise the role of women in caring for the environment. There are no special programmes for women,” Santos said. The questions of managing natural resources and distributing payments for environmental benefits also involve the issue of climate justice for women. There are a total of 9,000 ejidos and other kinds of communal land-based communities, such as indigenous groups, in forested areas in Mexico, and nearly 3,000 of them depend on sustainable forestry activities for a living. A total of 2.2 million hectares of forest are under the system of payment for environmental services, with a rate of 26 dollars per hectare, according to the government’s National Forest Commission. The professor is about to publish an analysis of gender and natural resources in the central state of Hidalgo, next to greater Mexico City, at the request of the governmental Hidalgo Women’s Institute. In her study, she says women lack information such as the date when trees were cut down and statistics on the income derived from logging. In fact, of 76 ejidatarios identified in the area, only six were women. Castañeda said: “We have not managed to get a gender focus included in the environmental instruments. It should be an inherent component. And climate justice is part of that focus. Besides, the impact of the projects on women has not been studied,” Castañeda said.